Bamboo Banks is a 40 acre farm nestling at the foothills of the Nilgiris besides the Avarhalla Stream, in the Mudumalai Game Reserve. Its enchanting setting with spectacular views and a salubrious climate surrounded by abundant and varied flora and fauna of this region makes Bamboo Banks an ideal getaway. Zerene and Siasp Kothavala started the Guest House in 1974 making them the pioneers in this area. In over 40 years satisfied guests from around the world have been their best advertisement, with many returning as friends. 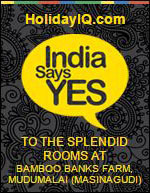 The Sprawling acreage of the property houses just 7 cottages of which 3 are independent ( Brick house, The Annexe, and The Cottage) and 2 separate units of twin cottages ( Acacia and Jacaranda, and Stone Houses I & II).This ensures that even at the busiest of times the number of guests at Bamboo Banks is not more than 30. We remain small and exclusive, so that our guests can enjoy the property in its natural surroundings, get personal attention and have a memorable holiday. The hospitality and food at Bamboo Banks are now well–known.We prepare wholesome home cooked food for vegetarians and non vegetarians.Meals are usually served in our open air dinning space, surrounded by our gardens that echo the lushness of the jungle around us. There are a variety of activities you can enjoy during your stay, and the peace and tranquility of the farm and the jungle will help you to relax and unwind. The Kothavalas invite you to share their distinctive home and enjoy a unique experience.